I never knew there were others. I wanted to find like-minded former Christian Scientists. I’ve been there. When I started this blog I felt I was the only one too. There were Ex-Christian Scientists who had found Jesus, but I was taking a more secular route. I started putting my story out there, and the response has been overwhelming. Christian Science is an isolating religion where talking about failures is discouraged. Finding that you are not alone in this struggle is liberating. I regularly hear from people who thought they were alone in their questioning, who felt they were the only ones who had “failed” at demonstrating it properly, and who have been deeply harmed by the teachings of Mary Baker Eddy and the practices that have stemmed from them. You are not alone in your questioning of Christian Science. You are not the only one that has “failed” to demonstrate things properly. You are not the only one who has left. You are not alone in this. Please do not be afraid to reach out for help and support. The following is a list of resources for those leaving Christian Science, as well as information about the religion and other information that may be of interest to those seeking a new path. For more resources & information, see the “Resources” drop down menu. 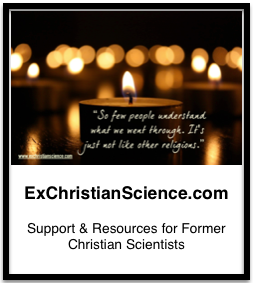 If you are leaving, or have left Christian Science, and would like to get in touch with a supportive network of former Christian Scientists, please e-mail me kat.at.kindism@gmail.com or visit “Leaving Christian Science” in the Resources drop-down menu.